There might still be a whole lot of controversy going on in the real world in regards to this upcoming award show, but I've always been a fan of the Oscars since I was a young girl, its the one award night that I look forward to the most. Mostly because I love to see what (or who) everyone is wearing, can you blame me though? Its so fun, the walk down the red carpet, beautiful, weird or just plain boring, its all interesting to see, including who's there and who isn't. Not to mention all the overdone speeches. Okay, okay, so what's really important is the awards that everyone receives, but overall just a fun occasion, even if I am just watching from my comfy Ikea sofa. Lol. With the Oscars airing this Sunday, March 4, I decided to put this fun Award night inspired "snack bar" in short notice, as I do most of the time. And though I'm cutting it close the good thing is that you can literally put this together just hours before the 90th Academy Awards actually begin, anyway. So there's no need to stress or to think that you can't make this happen in short notice because you can. You can't have an Oscar Viewing Party without a Voting Ballot, so I searched and came across this one from Vanity Fair, that you can print for yourself here. I would have loved to create my own version, but this is more of the real deal and I had very little time to put this together, so. After printing your ballots you can get to work on setting up your snack bar. I'm not lying when putting this together cost me only $15 and can cost less if you already have most of these things on hand. Its not an Oscar viewing party without popcorn, candy and at least one decent healthy snack or appetizer and drinks of course. Its basically going to be just the four of us or probably just us three, the kids and I, therefore only a few items were needed. I didn't want to overwhelm the setting or over indulge on sweets, especially when the Oscars don't come on until late Sunday evening. Here is what I bought, made and already had. And use any beverages on hand! So yeah it all totalled to $15, so I'm pretty proud of myself for that. As you guys already know, I love to shop at the dollar store, there are always certain things for parties and other things that are worth shopping for. 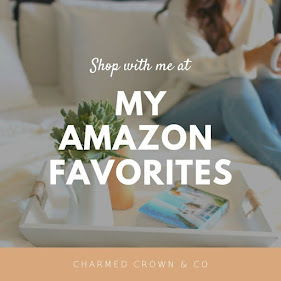 Not everything is of quality and so I'll have to do a blog post on what my favorite things are to shop for from there. Keep an eye out for that post. For the "ribbon garland" that I created, one roll of gold ribbon is all I needed besides the twine that I already had and used to finish it off. I cut each strand of gold ribbon between 16-17' inches and taped four strands together on one end to get that fringed look, then I just simply taped each fringed strand to a string of bakers twine that I had on hand. That was it for that. Super easy. For the "gold bling flower vases" I simply spray painted a 4 pack of hot pink cups in gold paint, once dry I hot glued the rhinestone ribbon to the top of each cup and voila my friends, you have a fancy Oscar worthy vase for your Oscar worthy faux or real flowers if you choose! I love real flowers but in this case I wanted to keep these budget friendly. Hoping this inspires you to throw that last minute or spontaneous gathering for you and your family or even invite some friends to the party! I love to entertain, but most of all I love to entertain my little family for fun moments like these. When we were handed the beer menu I was impressed. Really nice selection of beers and ciders. With 20 rotating craft beer lines, there is more than enough to choose from. This event space Atlanta is among the best around here.